Learning the lingo of your industry is an important aspect of running a small to medium sized business. From relating to your customers to being able to communicate effectively with your employees, having a good grasp of the jargon will only help you streamline your business operations. As a business owner, you can count on the old adage of learning something new every day. Part of what you’ll learn is how to complete your business accounting process — whether on your own or with the help of our Fort Collins CPA firm. No matter how you choose to run your back office and tax planning operations, the least we can do is help you to understand the lingo. 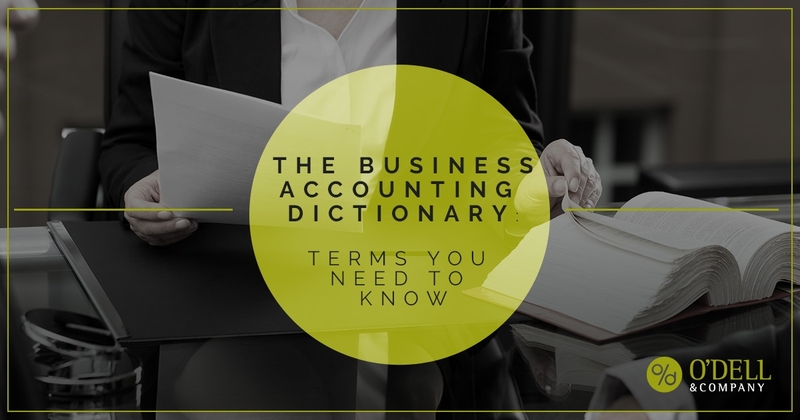 In this blog, we’ll be helping you study and overcome a few of the many challenges of running a business with our comprehensive business accounting dictionary. Here, we’ll define a handful of the top terms you need to know and understand so that you don’t get stuck or frustrated by terms and phrases that sound like a foreign language. Keep reading to learn more and contact O’Dell & Company today for sound advice, reliable support, and top-notch solutions when it comes to your business accounting, tax planning, budgeting, bookkeeping, and consulting needs. Remember this one from accounting class? If you’re a savvy business professional with a background in finance, then this will probably be familiar. However, if you were absent on the day your professor went over accounts receivable, then this definition might be able to help. Accounts receivable is, essentially, the money you are owed by customers for your goods and services. It’s an asset on your balance sheet because it is accounting for the money your good/service is bringing in. On the other hand, accounts payable represents the money that you owe to another business or a creditor. Accounts payable is a liability because it represents your money owed, whether it be for a purchase of supplies or payroll costs. We noted above that items in your accounts receivable ledger represent assets — but what exactly does “assets” mean? When it comes to business accounting, an asset is something of value that is owned by you/the company. Assets are typically tangible items like equipment and machinery, cash, property (like your building), and more. However, things like stocks and trademarks can also be considered assets. What in the world is a balance sheet, you ask? This is where all of your company’s financial information is placed for record-keeping purposes. The balance sheet is where you’ll list your assets (including accounts receivable), liabilities (including accounts payable), equity, and more. Efficient bookkeeping is essential for businesses of all sizes. However, it can often be neglected when there are so many other aspects to worry about when running a business. Cloud-based bookkeeping software like Quickbooks helps make your back office operations, such as maintaining your balance sheet, much more efficient. Our Fort Collins CPA firm provides these solutions as part of our services so that you can focus on the other aspects which require your attention. How much capital does your business have? Capital refers to the money/liquid assets that you (aka your business) has at its disposal. Working capital is often used to invest or make purchases which help the business operate, from buying a building to purchasing supplies or additional equipment. We mentioned equity above, but perhaps it’s best to define that term as well. Equity refers to the amount of money that has been invested into the business by you (the owner) and/or any other part-owners. With small businesses, equity is often split up as a percentage among owners/investors. Fixed: Fixed expenses are always consistent, which makes them easy to fit within your budget plan. Rent/mortgage payments and employee salaries are examples of fixed expenses. Variable: Variable expenses are those which can go up or down based on sales, production, or the market. Types of variable expenses include materials and supplies. Accrued: These expenses often fall under “accounts payable,” as one-off purchases for which you still owe payment. Operational: Operational expenses are the cost of doing business — literally. That includes things like supplies, taxes, legal fees, utilities, and marketing. This is what drives businesses of all shapes and sizes. Revenue is defined as the amount of money you (your business) collects for the goods and/or services you’re selling. Revenue is calculated prior to accounting for any expenses. Once expenses are accounted for, the money that is (hopefully) leftover is known as net profit. Every small to medium sized business owner needs to know exactly what a CPA firm is, and how a trusted CPA firm like O’Dell & Company in Fort Collins can help their business thrive and grow. A CPA firm is sort of like a coach and support system for your business; by providing advisory and consulting services, business tax planning help, and a whole lot more, a CPA firm can help alleviate the pressures of accounting so that you can focus on what you know best. From cloud-based bookkeeping software like Quickbooks, to cash flow and budgeting analysis, to business consulting and entity choice, our licensed CPAs have the knowledge and experience to help you run a more efficient business. We are also well-equipped to aid you with business transactions, sales, and acquisitions. We’ll help you find the solutions you need and stay in constant communication with you to keep you abreast on any changes or developments within your industry. It’s what we’ve done for countless clients since 1986, whether they are local small businesses in Fort Collins or anywhere throughout the country. What’s the definition of a healthy, efficient small business? One which works hand-in-hand with our Fort Collins CPA firm. Let us help you discover the solutions you need today. Contact O’Dell & Company to get started.